Set on a hillside of one of San Miguel's most exclusive neighborhoods, this newly expanded home offers a comfortable and luxurious setting for your next visit to San Miguel. You can take a relatively flat walk to the center of town in about 8 to 10 minutes. The original home is a 3-story colonial charmer with street entrance and garage. The new expansive wing begins on the third story of the original home and continues up the hillside. 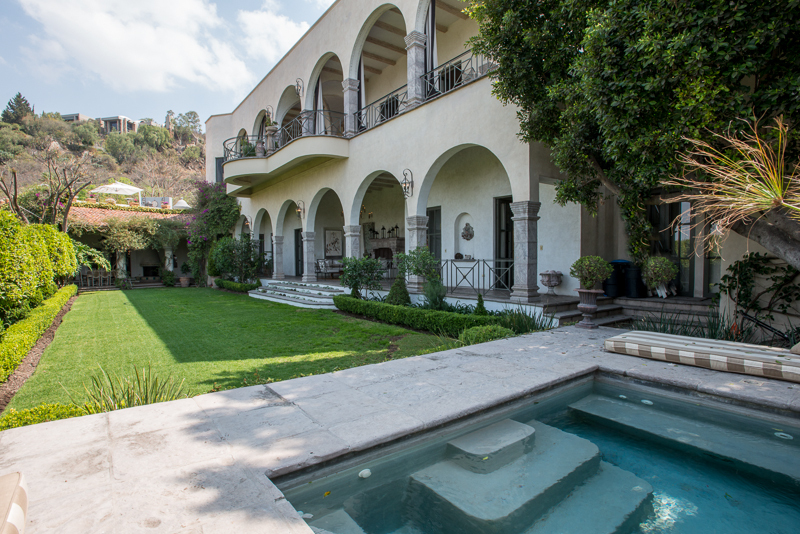 It is a elegant space with vaulted ceilings, large common areas for entertaining and beautiful views of San Miguel and the valley beyond. 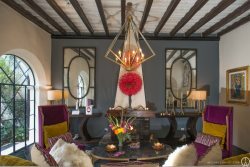 The decor is a chic blend of handcrafted furniture, cantera stone and a palette of light neutral colors. In the original home, the garage is on the street level along with a small foyer and stairway. The second level has two bedrooms each with full bath, one with a queen bed and the other with a king bed. The third level has a full kitchen and a large common area, which is a shared living room and dining room. The mastersuite connects with this part of the house, as well as the new addition It also has a master suite with king bed and full bath. The third level is also where you will find the first of several outdoor living spaces. Accessed from the living room, there is a large covered terrace with a sitting area facing a large gas fireplace and a dining table for 6. This area looks out onto a large yard and the new wing of the home. On the other end of the yard there is a dipping pool set back from the home and surrounded by lush landscaping. The first level of the new wing faces out onto the yard as well. There is another covered outdoor sitting area with a large fireplace and couches. On either side there is a bedroom. Both of these bedroom suites have a King bed, separate sitting areas, gas fireplace, walk-in closets, full bath with dual sinks and white washed cabinetry. One of these bedrooms along with the master have flatscreen TV's with DISH. As the entire new wing of the house faces west, you and your guests can enjoy gorgeous scenic views and sunset cocktails. On the second level of the new wing (actually the fifth level of the home), there is a formal living room with a gas fireplace and large windows. This room leads out onto the long terrace, which has curtains draping from the archways and also enjoys it's own sitting area. On the other side of the terrace is the formal dining room that seats 10 guests. There is also a second full kitchen on this level with stainless steel appliances and a center island. There is a separate entrance to the home from a gated driveway that runs up along the south side of the property. The entrance is on the backside of the home and on the top level of the new wing. This entrance has a guard post and is shared by two other large homes that sit a bit further up the hill. Please ask about the rates: we have 3 night minimum. There is a Vonage phone, wireless internet, and purified water throughout the house. The rate includes continental breakfast and gas to heat the hot tub. There is a cook, 2 maids, and a Gardener there 6 days a week: M-F 9-3; Sat.9-12. They have different hours for a weekend 3 night rental: Thursday - Saturday 9-3 and Sun 9-12.